10 Years ago we took a trip that transformed our lives. We've been lucky enough to share life changing moments with the one we love and this weekend at TBEX in Colorado we had our story showcased to the travel blogging world as a part of Expedia.com's Find Yours Campaign. This spring, we were asked by Expedia if we ever had a time where travel changed our lives. We told them this story – How Travel Saved our Marriage and Changed our Lives. And they liked it enough to include it in their latest campaign; Find Yours. We were elated to receive a call from a casting agent in Los Angeles to tell us that we got the gig and would be flying to Thailand to shoot a commercial. 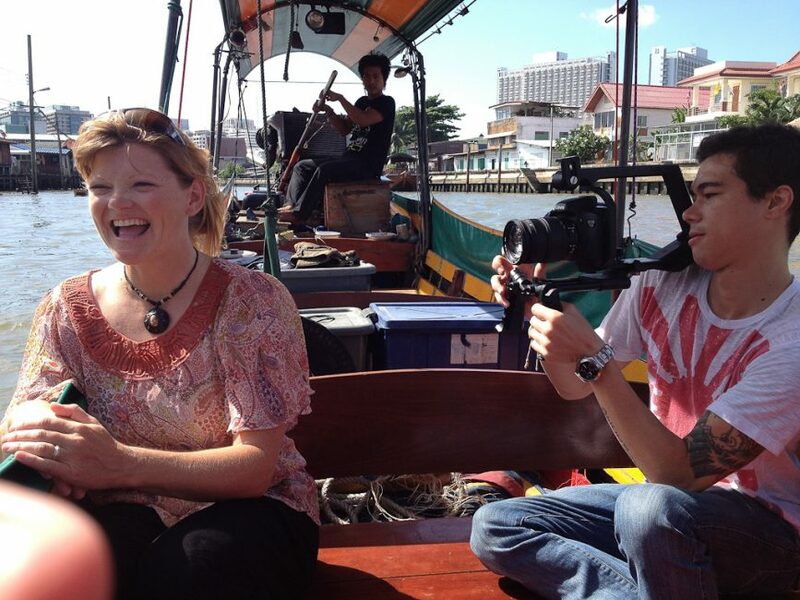 Fresh from an amazing tour of Europe we stepped off the plane in Bangkok to be greeted by a film crew. 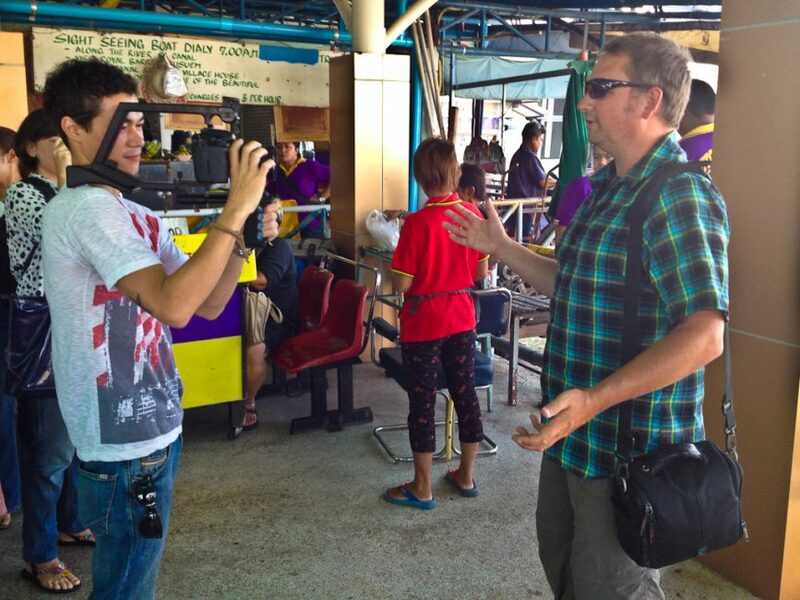 For the next seven days we shot scenes around the country re-enacting our very first trip to Thailand. We took a boat down the Chao Praya River, we visited the Golden Palace and we drove in tuk tuks and ate street food on Khao San Road. We flew to Ralaigh to do some rock climbing, paddling and hiking and made new friends with an incredible group of people. The crew was amazing and we had so much fun being in front of the camera. We feel truly lucky to be able to open our hearts and share our love for one another. We've had an amazing ride for the past 10 years and being able to travel and work together over these past three years has been a dream come true. I hope you enjoy the video as much as we did and we hope that this innovative campaign by Expedia will inspire you to Find Yours as well. See our fellow Find Yours traveler and friend, Trish of Trip Styler. She has an amazing story where she found her calling in Mexico. And the best thing yet, she's a fellow Canadian! With so many options to choose to Expedia is there to help you find yours. 35 Responses to "Find Your Harmony – Our Story Showcased in Expedia’s New Campaign"
Thank you for the interesting blog post! You are so right… traveling really makes you reconnect with the ones you love. 2010 was a really tough year for my husband and I, however 2011 summer vacation in Barbados ignited that hidden flame. The island has a rich history and awesome tourist attractions. To top it off, I got a great deal on a website that helped to offset the cost of hotel accommodation. http://www.jummpin.com I look forward to your next blog post. Hi Nunya, Thank you for your comment. I am sorry that you feel that way. It is our story and I would think that people would appreciate that it was Thailand and it’s people that inspired us to change our lives. Showing the beauty of South East Asia seems very diverse to us. Expedia has created a campaign with Expedia Find Yours that showcases the cultures and beauty of the world and highlights several different countries. What an incredible experience. It’s true how much travel can chance your life. Anytime someone asks, I am always sure to suggest they spend their money on experiences and adventures, rather than material items. Traveling light and far is the best way to step outside your comfort zone and make some personal growth, in my opinion. Now that we know Bangkok was the biggest life changer for you, how about the second biggest? The second biggest was The Tour d’Afrique. Our cycling race from Cairo to Cape Town. It was the trip that made us finally decide to quit our jobs in the film business and pursue travel full time. IT was a tough and challenging trip, but in the end, it helped us fulfill our dreams. What an amazing experience you guys! And I read the story of how travel saved your marriage as well.. Superbly envious! Do keep up the good work! Love your video too. Here’s hoping to more enriching travel experiences in the future! Great video Deb and Dave! Having met you both recently, I honestly never would have guessed that you struggled in your marriage. You can just see how in love you two are! Thanks for sharing such a personal story with all of us. This is so interesting you guys. I am glad you can share your story through a platform like this. Travelling together has changed our lives for the better, too. One day we’ll tell more of our story, but this has strengthened us like nothing else could have! You guys rule! Congrats on the gig with Expedia and fantastic story! Awesome video! You deserve all the happiness you have!! Love it.Simply – thanks for sharing your inspiration! This is such a great story guys 😀 You really are living the dream! Keep on going, on and up! Wow! How awesome. I’m so in awe of you guys. Raleigh was the place for me that turned my life around and rock climbing played a big part in it! We have so much in common. I love this story. Like I mentioned at TBEX, this one really touched people (along with the video Trish had). It’s videos like this that make me want to yell and scream to people “THIS IS WHAT IT IS ABOUT! !” I know people love the sights and destinations but you have to look deeper to those moments and experiences that touch and change your life. Thank you so much for sharing this. Thanks to Expedia for focusing on travel that matters, those life changing moments that touch people. I don’t expect my travels to have quite the impact that yours does. However, you were the people I enjoyed meeting the most this weekend and one of the highlights of my weekend (despite Deb forgetting my name). This story is an example why. What a cool experience! Did you feel like movie stars with a camera crew following you? Awesome story sure to inspire others and maybe even save other marriages! What fun to go back to the “scene of the crime” and relive the adventure that started it all. How Interesting is your story.By the tavel you’ve made it has a positive effect not just in yourselves but the important thing is with your marriage.You inspired many people especially those who are starting out their marriage.Lessons have got from both of you. The video is awesome but it wouldn’t be that great if the story behind the video – your story – wouldn’t be so wonderful. Congratulations for your accomplishments through traveling together! Awesome video guys! That must have been some trip! Your “commercial” moved and inspired me. I had a tear in my eye as I watched it! Good job and I think you will inspire many with it!